Sandy Ashri was a self-described "non-cook" for most of her life. Her daughter, she says, became a "gourmet cook" because she had grown up in a home devoid of little more than a toaster and a plainly stocked refrigerator. In 2007, at age 57, her mahjong group decided to take a cooking class together at a school named Delicious! which is run out of the Hod Hasharon home of South African immigrant Lisa Brink. "I announced to everyone that I just came to watch-and that at most, I'd maybe pick up a recipe for soup," recalls Ashri. But she quickly became a devotee, and within weeks found herself in the supermarket line with dozens of ingredients for a multi-course meal for which she invited friends to her house - all recipes she learned at Brink's classes. But she wasn't entirely prepared. "As I stood in line, it suddenly dawned on me: I didn't own an oven. I had just moved into a new apartment and figured that I'd never cook, so why buy an oven?" She rushed back and bought a toaster oven, and the next day cooked a successful meal for a half-dozen friends. Ashri is one of the more notable turn-around cases among some 1,000 English speakers in Israel who have attended Brink's cooking school, which she has run - as the sole teacher - in her own kitchen since 2007, a year after moving to Israel. About two-thirds are regulars. All the classes are taught in English, but native Hebrew speakers have begun to attend. Her burgeoning clientele tell a variety of personal stories about what brought them to Brink's classes - from new brides to those desperately-in-need-of-cooking-help to immigrants looking for a relaxed, English-speaking oasis, with good food to boot, at the end of a busy week. 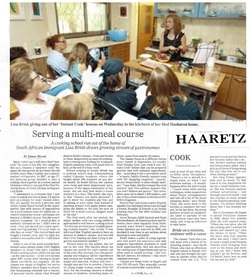 Before coming to Israel, Brink ran a cooking school near Johannesburg called CupcakeAcademy where she taught about 300 students on any given month. In South Africa, her classes were large and more impersonal; here, because of the space constraints of her home, she can only host about a dozen students at a time. The result, she says, is that "classes are more personal: I get to know the students and they get to talking to each other. And instead of standing around with paper plates sampling the dishes at the end, we now sit down for a multi-course, elegant meal at the end." The first week after her arrival, the single mother with two young children approached a well-known cooking school "to offer my services as an English speaking cookery teacher," she recalls. "I was informed that 'English speakers have no interest in cookery classes' and was told that I'd be 'wasting my time trying to target this non-existent market.'" Turned down by the school, she set out on her ownץ Her clientele runs the gamut: secular and religious (all her ingredients and recipes are kosher ), young and old, single and married, women and men - though men are few in number. Clusters of young single women come from Tel Aviv for the evening classes; a steady stream of students, including many retirees, come from nearby Ra'anana. The classes focus on a different theme every month: in September, it's usually High Holiday food. Last week it was "Instant Cook" dishes that can be prepared quickly and with minimal ingredients, like - according to her e-newsletter pitch - "a hearty, family-friendly, autumn soup with NO chopping required," "speedy, savory bread sticks 'n other simple starters," "easy-bake, Mediterranean flavored chicken" and "two sublime desserts that you won't believe are pareve." Her newsletter goes out to about 1,500 readers, and she writes a food column in the bimonthly ESRA Magazine. Sharon Fast, who is not a native English speaker but had heard about Lisa through a friend, brought 12 friends to an Indian cooking class for her 40th birthday last February. Aviva Taragin, Edith Epstein and Huda Weichselbaum, all American-born and Orthodox, have come regularly from Hashmonaim since Brink's beginning. After Elana Salomon got married in 2008, she decided it was time to get serious about learning to cook and joined. Brink makes a point of using ingredients that aren't too expensive and only suggests ingredients available at most local supermarkets. And she describes the various uses of ingredients and spices often used in Israeli cooking - like low-fat soft cheeses, for instance - that aren't common overseas. Classes are three hours in length and cost NIS 150 each. They generally consist of a dozen students who watch Brink cook at least 10 recipes per class and scribble notes throughout. "There's a lot to absorb in a single class, so when I see attention waning – it usually happens after the third recipe – I teach some table-setting techniques, make suggestions about flower arrangement and tick off a list of the latest shopping deals," says Brink. Then, she turns back to the kitchen to complete the recipes. In the last hour, the group gathers around an elegantly set table to parake of the multi-course meal they have made, and wrap up leftovers to take home. The classes "turn into a social meal with a bunch of interesting people," says Sarah Fisher, who runs an afternoon English school in Ramat Aviv and who has brought her parents to classes when they've visited from the U.S. "I've learned to cook and now have a few favorite dishes that I do…..like Brink's smoked salmon and lemon potato salad. And I pick up all sorts of things along the way, like how not to cry when cutting an onion." But what Fisher appreciates just as much "is that Lisa is a true inspiration for me as a small business owner. She has become popular without advertising – just through word of mouth – and she reaches so many people in the English-speaking community. I'm always thinking about how I can emulate her buzz." Barry Grossman, 66, began to attend Delicious! Classes in 2008, about 5 months after his wife passed away. "When she was alive, she did the cooking and I washed the dishes and cleaned up," says the father of three. "Then for more than 4 months after she died, I didn't have to cook a single meal because friends were bringing food over to the house and inviting us out. But I knew this couldn't go on forever, and I'd better learn how to cook for me and my kids."